Prepare to take off on the world's most authentic airline game. Radio calls, emergency landings, radar approach, air traffic control, it's all here! 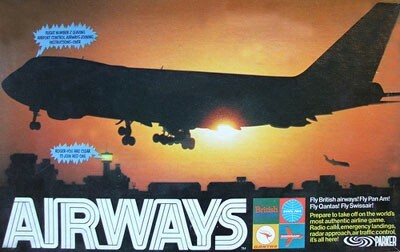 The Airways board game was published by Parker in 1972. The object of the game is to fly as many passengers as possible from your home airport to the destination airport on the main board. The first player to disembark the passengers from all 4 of his flights ends the game and the winner is decided by the Air Traffic Control, depending on the number of passengers each player has managed to land.